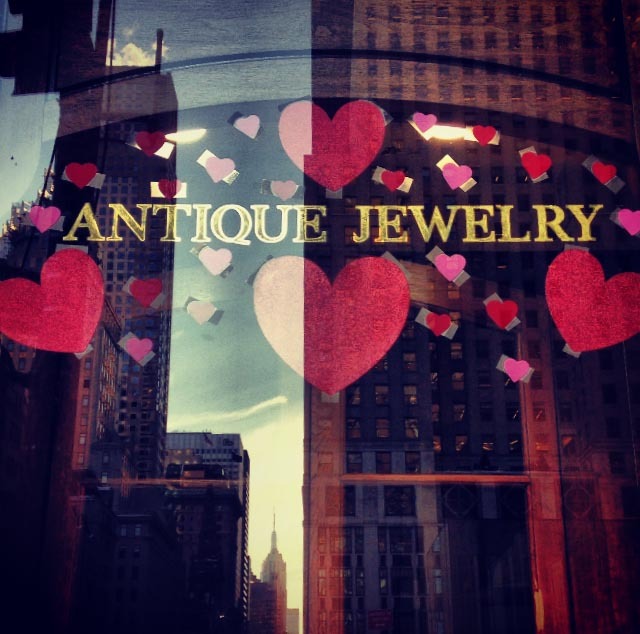 Gifts of jewelry as tokens of affection date from ancient times, featuring design trends like cupid, clasped hands, lover’s knots, mottoes, and hearts. The heart symbol has been a consistent representation of love. Mythologists surmise it evolved from the ivy leaf, an ancient symbol of immortality. It was a common wedding gift in ancient Greece, and came to represent friendship and fidelity due to its snuggling and nestling characteristics and year-round greenness. Certain historical symbols of love seem quite strange to modern eyes. For example, the use of hair in sentimental jewelry was quite popular in the eighteenth and nineteenth centuries. Hair was woven into jewelry, or hidden in lockets and underneath portrait miniatures of loved ones. Some pieces of nineteenth-century jewelry contained messages through the ‘language of stones,’ where stones were arranged so that the first letter of each one revealed a hidden message. A later example of the mystery in sentimental pieces is our Naval Signal Flag Bracelet, spelling out “ I Love You.” In case that wasn’t cute enough, the gold links are kissing seahorses, another symbol of commitment as they mate for life. These symbols of love have stood the test of time, just like antique jewelry. Our collection includes hearts, bows (if you are about to “tie the knot”), or you might choose something unconventional to imply your own hidden message. Whichever you choose, it will be timeless; after all, diamonds are not the only things that last forever.